The rise of coworking spaces in hotels as work becomes more flexible, the city of Atlanta is transforming into a showcase for biophilic design, and more news. Standing desks might not be the ‘cure’ we thought they were, how to create open work environments that actually foster collaboration, and more news. Bank of Canada taps Perkins + Will with the challenge of fashioning a modern workplace inside its historic building in Ottawa. Ted Moudis Associates’ Workplace Strategist Kate Wieczorek shares her thoughts on the recent Harvard study examining the effects of the open plan. 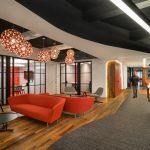 Compass tapped Vocon to design a multi-functional space that was visually open and with diverse environments that would foster work, collaboration and creativity. With much of recent press focused on the open office debate, Work Design Magazine Publisher, Bob Fox, shares his thoughts on the topic. Principles of community and collaboration at the heart of the design of Hayball, an Australia architecture practice in Surry Hills NSW Australia. GoCanvas CEO James Quigley has created a relaxed work environment that promotes empathy to foster innovation and collaboration. 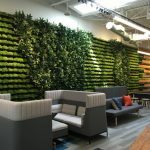 Why workplaces are moving away from formality, Room and Boards revamped HQ is a nature-lover’s dream, and more.